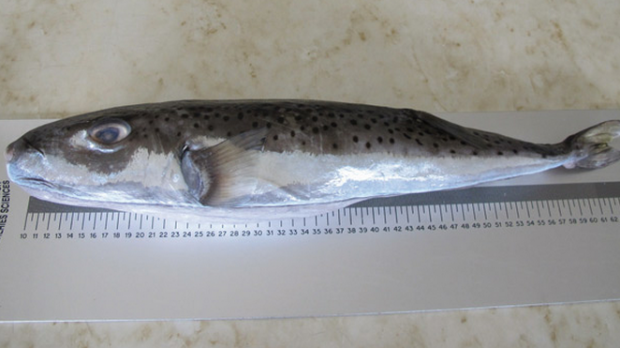 A poisonous fish that could be fatal if consumed has been spotted for the first time in Maltese waters, leading local researchers to call for an early warning system and an information campaign about its danger. The silver-cheeked toadfish, or Lagocephalus sceleratus, is a member of a family that is represented by the better known blow or puffer fish. However, the toadfish caught in Malta is actually one of the most dangerous members of this family and its occurrence requires to be strictly monitored. The specimen has been studied by marine biologists Andreina Fenech-Farrugia, Luca Castriota, Manuela Falautano, Ernesto Azzurro, Franco Andaloro and Alan Deidun and is now at the centre of a scientific paper they have published together. This family of fish has received a lot of scientific attention over the years due to the poison in its tissues, known as tetrodotoxin. The powerful neurotoxin, if ingested, can block nerve “function in mammals including humans, ultimately causing death by paralysis of the respiratory muscles”. Its rapid spread and successful growth in the Mediterranean Sea could be due to its “somewhat broad thermal tolerance” as this tropical species had already penetrated colder Mediterranean areas, such as the north Aegean sea. More in Times of Malta and the e-paper on timesofmata.com Premium.